"Now, don't get jittery, Comco. There're a lotta Command Ships." 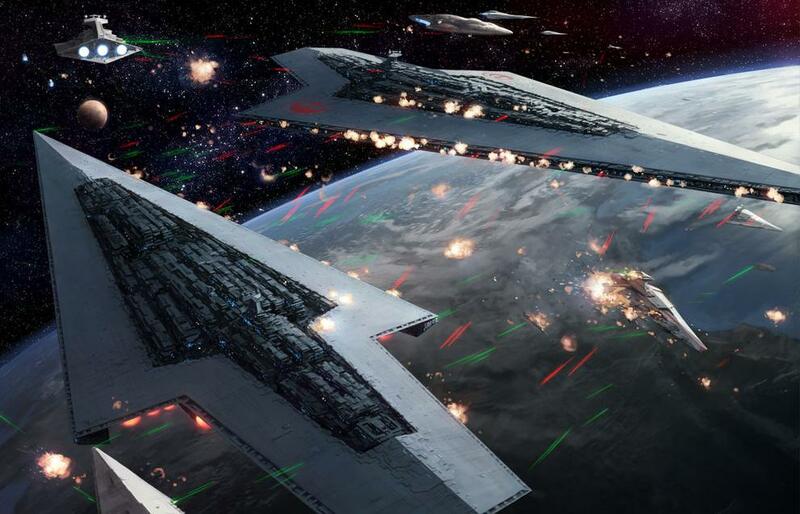 Seriously, it could easily be another star dreadnaught type ship, one that we've never seen before (and likely won't see in full until 'sponge is hired again to fill in the blanks ). I for one am happy either way. So cool. I guess it could be an Executor, i'd be more convinced if the planet in question was Endor. Although given the current state of the crashed starships, it may very well be Endor. what do you think of this badboy? i love the hull stabbing out in the forward section. I don't love it, but I don't hate it. Reserving judgment until we see the whole thing. It is very derivative, and that's a GOOD thing. Looks like it has been damaged or something and then customised, the basic shape looks to be exactly like a standard ISD and then with additional bits added in some places like that section sticking out of the front, but also with some bits missing, looks like they've lost the command/conning tower and had to find a smaller replacement. Be interesting to see if there are other custom/ugly (like those starfighter custom models patched together from disparate ship components) ISDs out there. Sorry I'm late to the party but I'm thinking it is a Executor Class or a slightly modified version. The angle could be off a little. Here is something I quickly came up with at work. The only thing I see different are the engine nozzles. It is very close. Sorry I'm late to the party but I'm thinking it is a Executor Class or a slightly modified version. The angle could be off a little. Here is something I quickly came up with at work. The only thing I see different is the engine nozzles. It is very close. it definitely does look like a exec class ship. I agree.... And given that so far, the actual design on the engine nozzles is not very well known since there is no real shot of a shutdown engine, we can argue that it's simply a different contractor they had employed. got to wonder how an executor ends up upside down on a planet - any conceivable crash would totally wreck it beyond recognition - a bad landing or something and why is it upside down? i thought i was the only one wondering this. then again i thought there was only one of them. the one in empire and jedi and that blew up against the d star 2. In the expanded universe there were at least two more that I know of. Here is two of them going at it. The Orinda on the left and the Lusankya to the right. Notice the New Republic logo on the Lusankya? I'm mostly a Star Trek fan but the Executor Class ships make me blush with envy. It's Star Wars, more Space Fantasy than Science fiction. When you have lightsabers and the force etc, anything's possible. If a ship can do a few thousand g, a crash is not likely to hurt it all that badly. Highest canon source - Invisible Hand falls into the atmosphere, breaks in two, and the front half comes down on the surface, basically intact. So breaking in half wouldn't disable anything actively holding a ship together but being upside down would? Nice work. :thumb: Fair enough - I'll pay that. There are some minor differences, but you could easily put that down to variations in the design. Executor was the first in its class - I don't think we were ever told it would be the only one in its class during the original trilogy. Given they built Executor in complete secrecy, it's no big stretch to believe they did another as well. "Inertial Dampers" - or as a cynic might call them... plot. All interesting stuff, but always worth bearing in mind that ultimately none of it is real. In the same way that people (occasionally) survive parachutes not opening etc', there are all sorts of freak occurrences that defy explanation happening with regularity. In a fantasy story centred on heroic actions, a ship falling out of orbit and there being survivors is almost par for the course. New trailer, new ships, new discussions and all the fun that goes with it. Posts from Fractalsponge's 3D WIP thread moved here as it's a more appropriate place for discussion. Ah, that explains how this thread with all of these replies sprang up overnight. "Don't get jittery, Luke. There are a lot of command ships." That alone suggests that the Executor isn't the only one. While the rebels wouldn't necessarily know every single Imperial ship, you have to assume that they'd know if Vader had his own special ship. If those ships had been dragged out of orbit by a powerful force user, their engines could have been struggling to keep them aloft the whole way down, they might have only crashed at a hundred miles an hour or less. That's a good point. We know some Jedi survived the purge, so one could have been on that planet and brought down the ship. the movies suggest that is not very plausible. i.e. big difference between pulling a starfighter from a swamp and moving it a few dozen meters than pulling a capital ship hundreds of kilometers from orbit to crash into the surface. I guess you've never played The Force Unleashed, where you use The Force to take down an ISD. It wasn't all the way up in orbit and may have been damaged already, I don't remember exactly. The same could have been the case here. 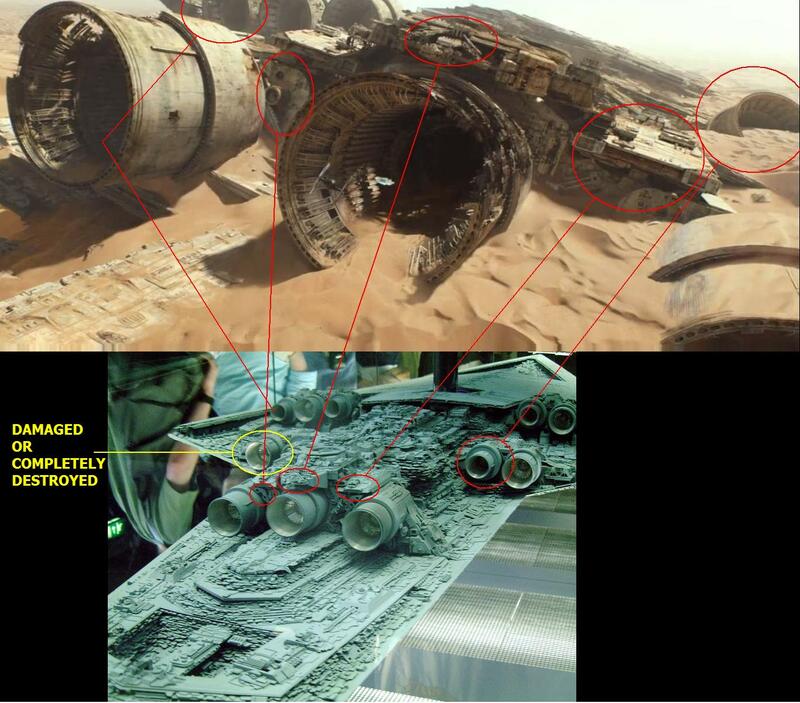 There are other explanations for how the ship could have "soft" landed upside down. The crew could have had breaking thrusters and partial control when they were crashing, but not the ability to right the ship. People just assume it was falling at breakneck speed, but that doesn't necessarily have to have been the case.